MFK Fisher, the incomparable chronicler of France (and food) wrote that her husband used to regale her with tales of the “real Paris” – in the ‘20s – while they were living in France in the ‘30s. Later she revisited old haunts while introducing her children to France in the ‘50s, telling them about the “real Paris” of the ‘30s and ‘40s. Now Woody Allen has made a fanciful film for romantics of all ages on that very subject – finding the Golden Age of Paris. The Woody Allen-like protagonist of “Midnight in Paris,” the hapless would-be writer Gil, wants nothing more than to wander the moody streets and conjure the artist greats of the past, but his hard-nosed fiancée is there to shop. You can see where this is going, and eventually our hero does time-travel to a far, far better place – Paris in the ‘20s, schmoozing with Hemingway, Fitzgerald, Zelda, and Gertrude Stein. Then a dark-haired beauty leads him to an even more distant perfection – la Belle Époque – where the likes of Monet and Degas pine for the authentic Paris of the Renaissance over the strains of the can-can. This film is a delight, both a poem and a paean to a city that might be most beautiful in the rain. As for it’s most magical moment? The ‘60s, of course, when I was there. Or was I? I love Paris in the rain during “canicule” times. 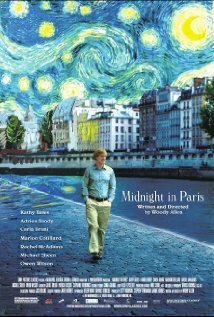 The film, a poem to Paris from Woody Allen, sounds interesting. I will not miss it. Thanks for sharing your romantic take on it.